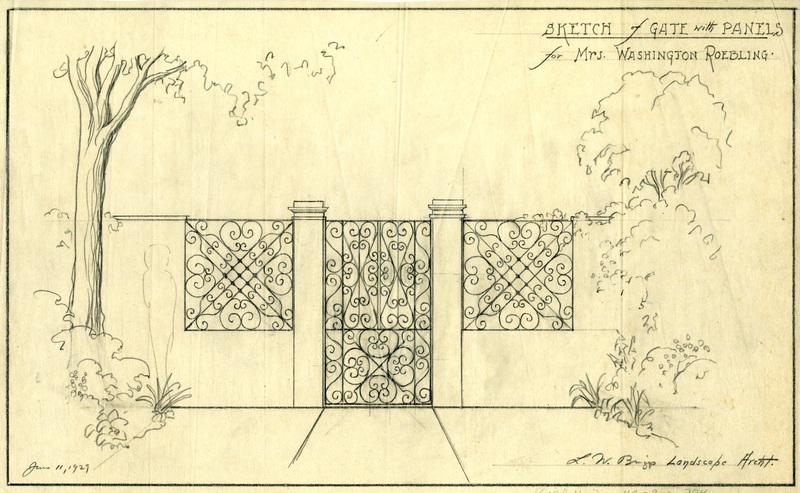 Sketch of Gate with panels. Courtesy of The South Carolina Historical Society. One of Briggs’ first design commissions in Charleston was for Mrs. Cornelia Roebling, widow of the famous engineer Washington Augustus Roebling, who oversaw construction of the Brooklyn Bridge. Shortly after the death of her husband, Cornelia Roebling, a native South Carolinian, purchased the William Gibbes House at 64 South Battery. Roebling insisted that Briggs develop a design that respected the historic integrity of the site and reflected the tradition of old Charleston gardens. This drawing illustrates Briggs’ homage to historic iron gates that have graced properties throughout the city since the colonial era.